Protects seats against weather and UV damage. Fabric coated for maximum water resistance and repellency. Elastic cord locks around safety sign on seat back. Large fits 2305, 2320, 2520, 2720 and 4105 Series Tractors. 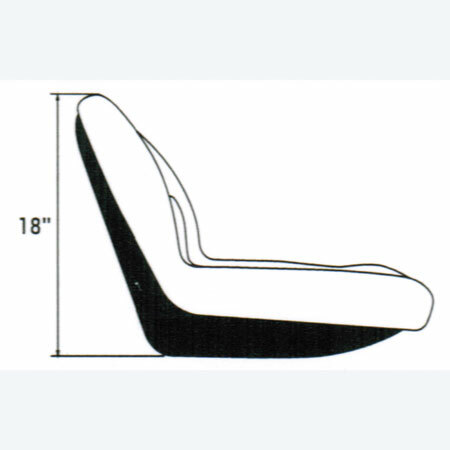 ordered this cover for a 5105 JD tractor. my seat was cracked and was told it would be expensive to replace it. I found this one on the net and ordered. 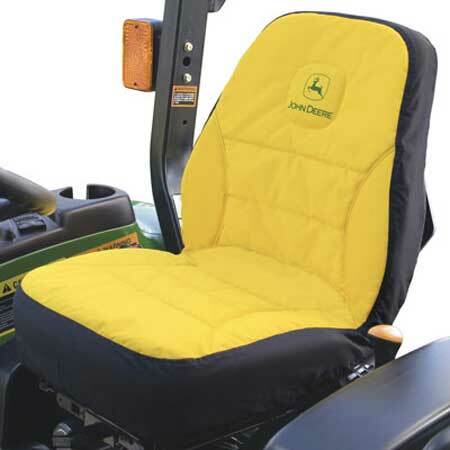 very soft and cushiony and fits my tractor seat like a glove, i'm a 71 yr old grandmother and spend hours on my tractor in the field. Very pleased with your product. Thanks for saving me a lot of money in these hard times. This is exactly as advertised. Good quality product, easy installation. I had a couple of slits in the seat of my John Deere 790. I good not justify the almost $200.00 + for a replacement seat so I opted to go with the cover and am very happy with its performance. Apparently there is no available seat cover for my new X739 garden tractor. So I ordered this one and overall it is a decent fit. The price was so affordable, that I feel it is worth a try. Materials are good. It is missing a pocket on the backside, which the illustration did not show. It fits great but I couldn't get a seat warmer to fit under the cover. The gift was delivered quickly after ordered. Thank you. My experience with this company went without a hitch. The person I spoke to explained how to measure the seat for the correct seat cover. When I received it, it fit perfectly. Thank you so very much. Item is exactly what I wanted.